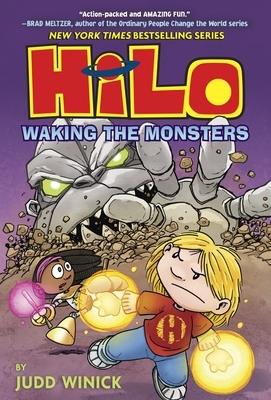 Hilo Book 4: Waking the Monsters (Hardcover) | novel. Dog Man meets Big Nate in HILO-the hilarious New York Times bestselling graphic novel series that kids (and robots!) love! "A Total BLAST," says the Miami Herald! Chock full of MORE MONSTERS! MORE ACTION! MORE LAUGHS! MORE FUN! DJ and Gina are TOTALLY ordinary kids. But Hilo isn't! ALERT! ALERT! ALERT! Has our favorite space boy finally met his match? Not if D.J. and Gina can help it! Mega Robot Monsters are suddenly waking up all over and they're TOO BIG and TOO STRONG for Hilo to fight on his own! Luckily, he doesn't have to! He has GINA and some brand new SUPER POWERS on his side! Being heroes can be super fun-but it can also be SUPER dangerous! And the closer Hilo and Gina get to saving their world from the monsters--the closer Hilo gets to the dark secret of his past. Does he really want to know? Do WE?! Here's what people (and robots!) are saying about Hilo! * Nominated for multiple State Awards! JUDD WINICK lives in San Francisco with his wife, their two kids; and their cat. Judd has scripted issues of bestselling comic series, including Batman, Green Lantern, Green Arrow, Justice League, and Star Wars. Judd also appeared as a cast member of MTV's The Real World: San Francisco and is the author of the highly acclaimed graphic novel Pedro and Me, about his Real World roommate and friend, AIDS activist Pedro Zamora. Visit Judd and Hilo online at juddspillowfort.com or find him on Twitter at @JuddWinick.